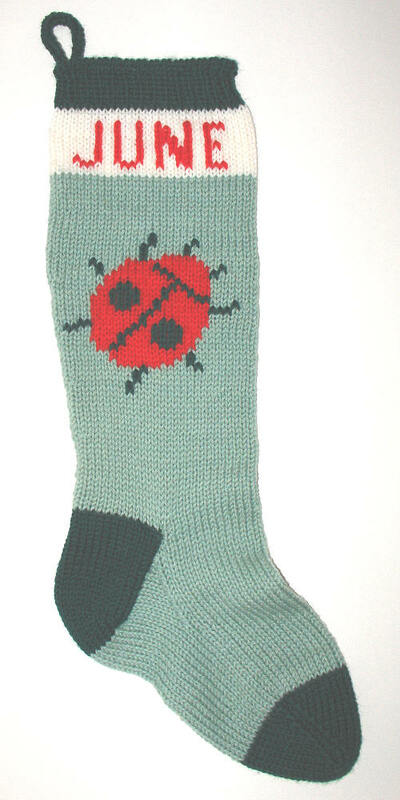 Here are examples of custom Christmas stockings that I've knit with animal pictures on them. Some are for pets, and others represent a wish or a mood. Stockings with animal pictures are often very unique. Please look to see what Customers Say about stockings I've knit with animal pictures. This whimsical giraffe is carrying a beaded Christmas wreath around his neck. Whether you call him a wallaby or a kangaroo, this festive creature is on his way to deliver a Christmas gift. A photo of a golden retriever was the model for this picture. This dog picture and the next one were each based on the same charted design. The customer sent me photos of her dogs so that I could adjust the color choices to match. For a more feminine touch, we used a hair ribbon for Roxy. This is one of the most unusual Santa designs I've seen! It never occurred to me that Santa might have a dog. This lovely design uses two shades of green to lend depth to the holly. I used a different stitch than usual for the name, since it wouldn't fit otherwise. This unusual design was much more attractive than I expected. It would be perfect for an outdoorsy-type man. Another non-traditional stocking, with picture and colors chosen by the parents. The wool yarn had perfect colors for this one. If you're interested in a stocking with an animal picture on it, find out more about ordering custom Christmas stockings.